I’ve never been to Italy before and, until recently, I thought that all Italian restaurants served pepperoni pizzas and big bowls of bolognaise. 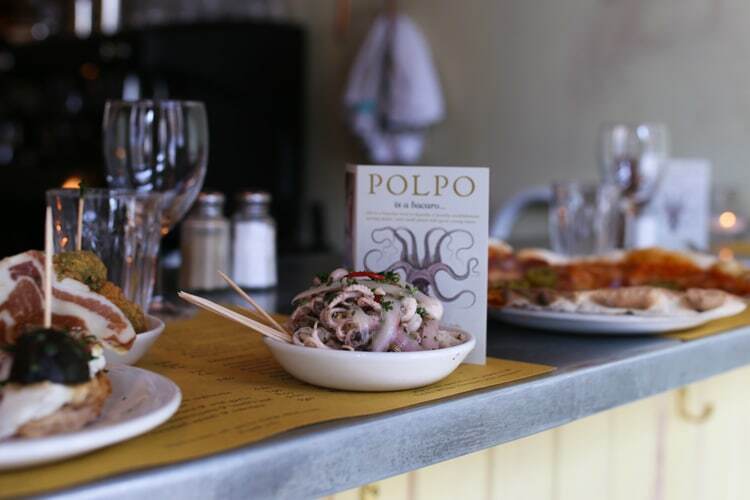 Last week, however, I realised how wrong I was when I visited Polpo. 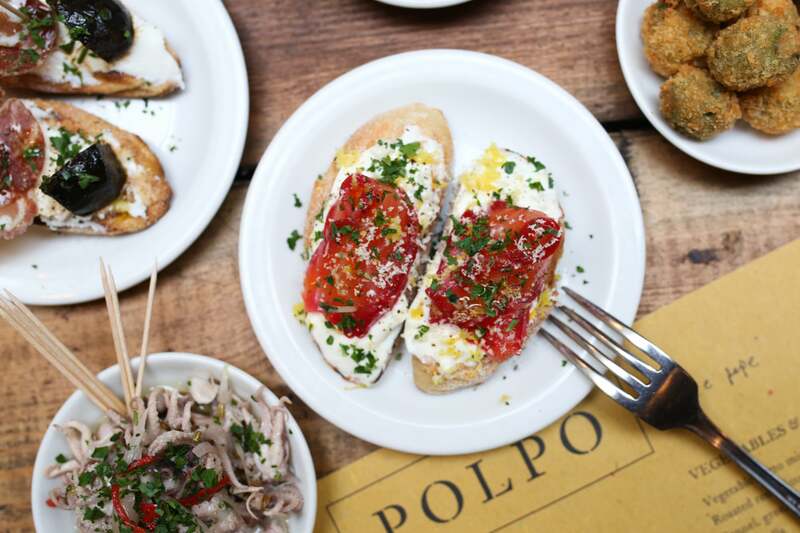 Polpo (which means octopus in Italian) is a bàcaro – a Venetian wine bar and restaurant with simple food, good wine and an informal atmosphere. 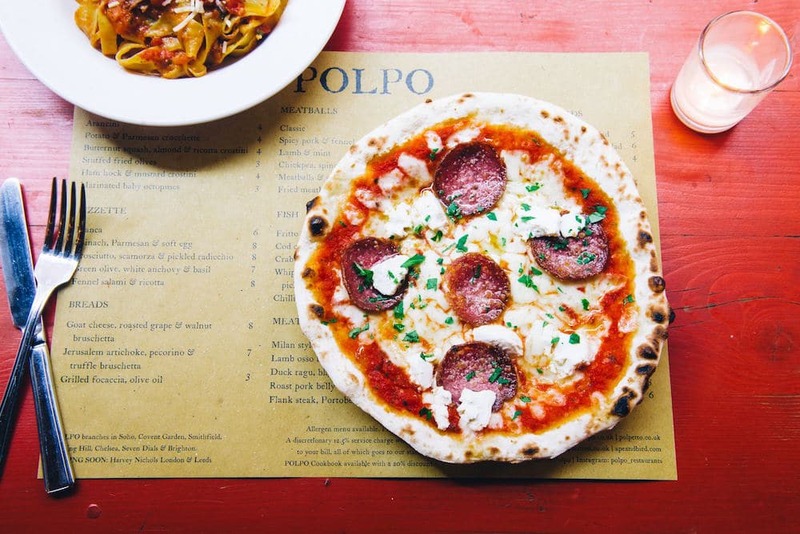 Inspired by the backstreets of Venice, Brighton’s Polpo was the first branch of this British chain to open outside London. The magic begins as soon as you draw back the curtains in the entranceway and enter the bar area. Here, my partner Tommy and I were greeted by the barman who, mid-way through shaking a cocktail, welcomed us in and offered us a drink. Almost everyone seated in the bar seemed to be sipping a cocktail or a spritz – a Venetian pre-dinner drink (or apertivo) made with prosecco and bitter liqueur, like Aperol. On this occasion, however, I opted for a small carafe of the Polpo house white wine, while Tommy went for the house red. 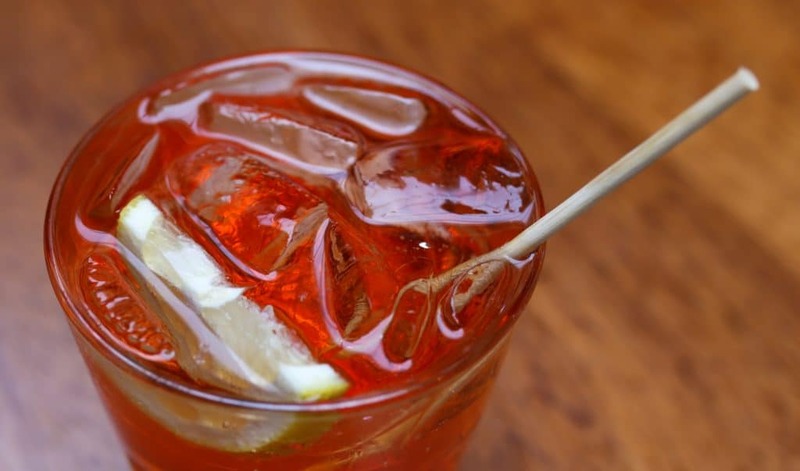 All the wines and beers on the menu are Italian and, along with cocktails, mocktails and spritzes, there’s plenty of choice. 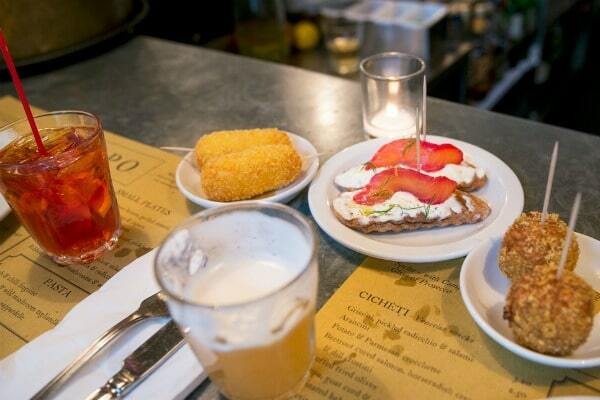 You can order food at the bar, whether it’s a few cicheti (Venetian snacks) with your drink, or a full three course meal. But if you want to settle-in for a longer meal, then it’s better to book a table in the restaurant area. A large room, with painted brick walls, reclaimed wooden floors and napkins draped over the table-lamps, the restaurant space has a stripped-back, informal ambience. The tables are very well spaced – there’s no risk of knocking elbows with fellow diners here – and the low-volume background music means you don’t have to shout across the table. 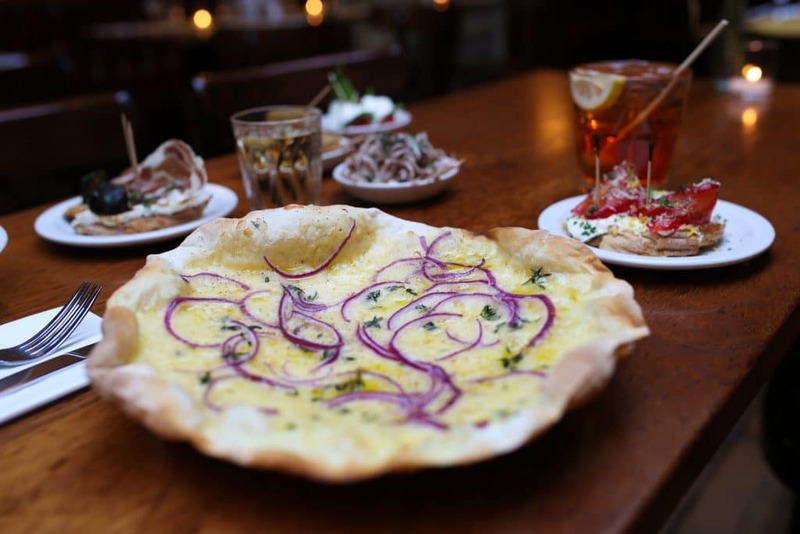 While Italian pasta and ‘pizzettes’ (small pizzas) feature on the menu, there’s a whole world of other fish, meat and vegetable dishes to try, including dishes such as ‘whipped mackerel’, ‘rabbit terrine’, and ‘roasted red chicory’. 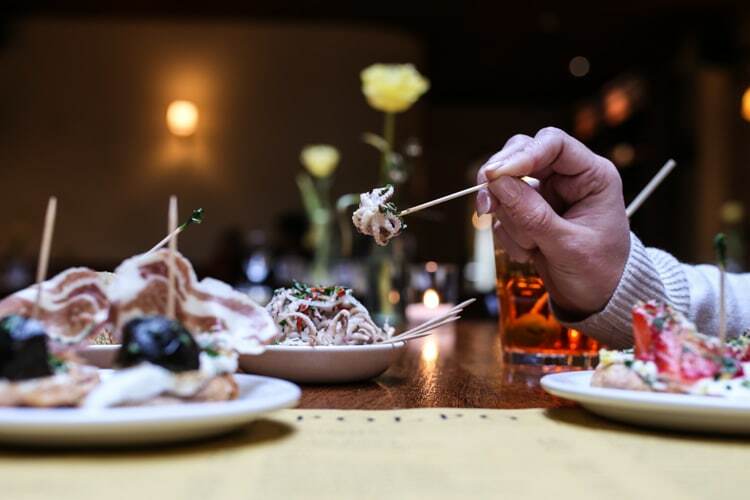 Served as small plates, most dishes are designed to be shared. Some of the pasta-based options could work as a meal for one, or you could have two or three smaller plates all to yourself. 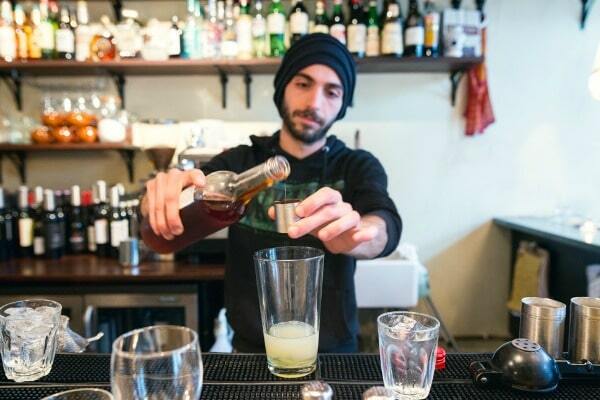 If you’re not sure what to order, just ask the waiting staff. Our waitress Maud had clearly tried everything on the menu and was full of recommendations and suggestions. 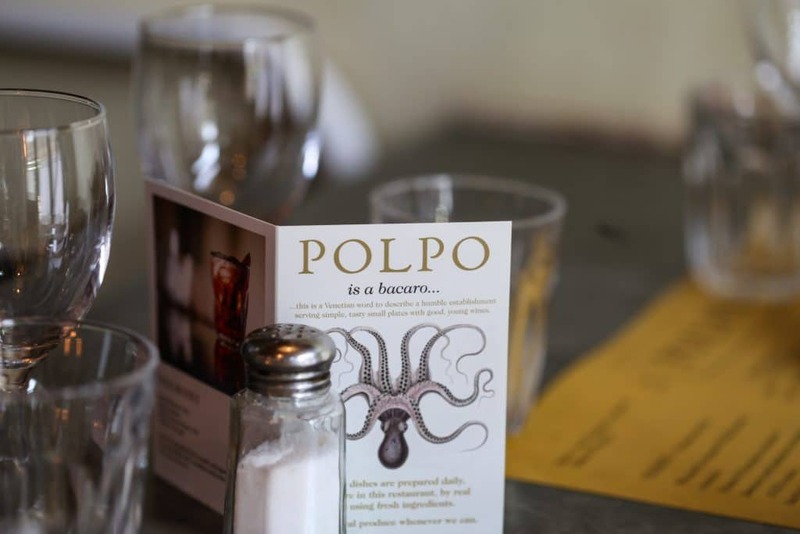 “If it’s your first time at Polpo, you’ve got to try the octopus,” she enthused. Taking Maud’s advice, we started with the marinated baby octopus, along with a plate of fried stuffed olives. Flavoured with garlic, olive oil and fennel seeds, our delicate octopus dish made a great contrast with the deeper flavour of the green olives, which were stuffed with salty anchovies and coated in a smattering of crispy breadcrumbs. Having ordered four main plates to share – two meat, a fish and a salad – Maud advised eating the fish and salad together first, followed by the meat dishes. This seemed like a good suggestion, and was far better than having a whole medley of dishes all at once. For the fish, we opted for Fritto Misto – a classic Italian dish of lightly fried seafood. 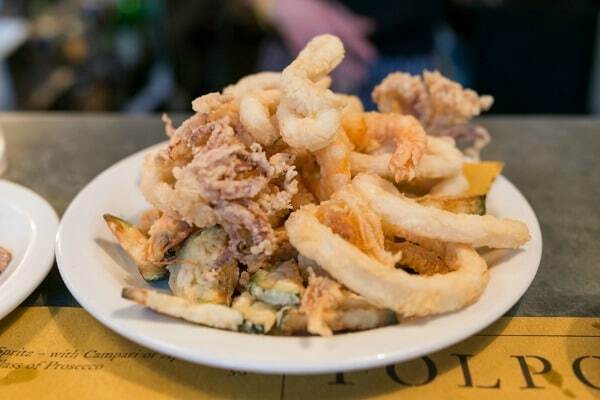 Polpo’s version has flavoursome king prawns, tender calamari and thick slices of courgette. With a big squeeze of lemon, it was a great plate to share. And, while ‘side salads’ are often seen as a secondary dish, the fennel, green bean and almond salad we ordered was anything but. A combination of sweet fennel, and slightly bitter frissé lettuce, with a zap of lemon, kick of salt and crunch of toasted almonds, it was the epitome of simple, high-quality ingredients perfectly put together. Moving on to our meat dishes, we shared a juicy pork chop on a bed of stewed white beans, topped with braised wild garlic. New on the menu, I’m sure this will soon be a firm favourite and, if you’re not into food sharing, would make a great meal for one with a side of ‘garlic and rosemary roast potatoes’. 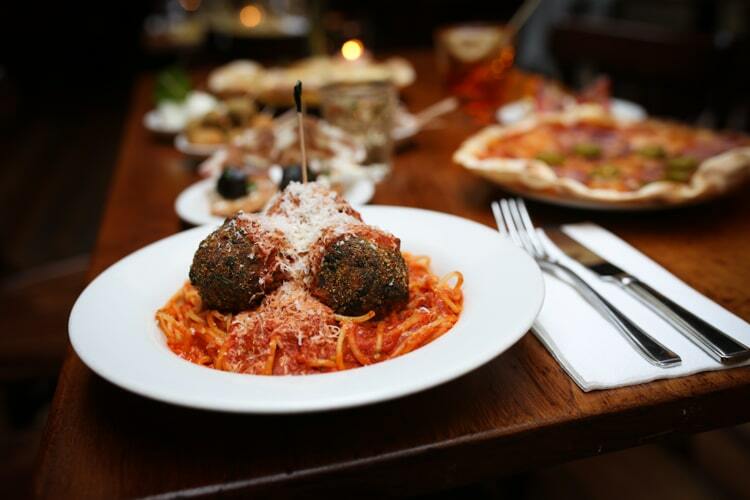 For our second meat dish we chose spicy pork and fennel meatballs from Polpo’s meatball list (which includes a chickpea, spinach and ricotta option for vegetarians). Pork and fennel was an excellent choice – the meat was full of flavour, and the tomato sauce they were coated with had a wonderful warmth of chilli. A close contender with the salad, this was probably our favourite dish of the evening. Seeing as we’d opted-out of the Aperol spritz aperitivo, we ordered an Aperol sorbet for dessert instead. Refreshing and sweet with a mild bitter orange aftertaste, this was just my sort of thing, while Tommy preferred dessert number two, tiramisu. While other tiramisu I’ve tasted have been overloaded with creamy mascarpone, Polpo’s version has a more even distribution of sponge and cream. 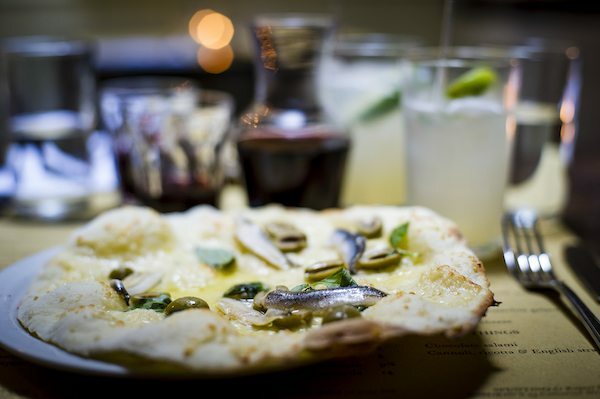 Rich and sticky, with a hint of coffee, a whiff of alcohol and a thick dusting of cocoa, it tasted divine with the full and fruity flavours of the restaurant’s recommended dessert wine: a 2014 Recioto di Soave Classico. 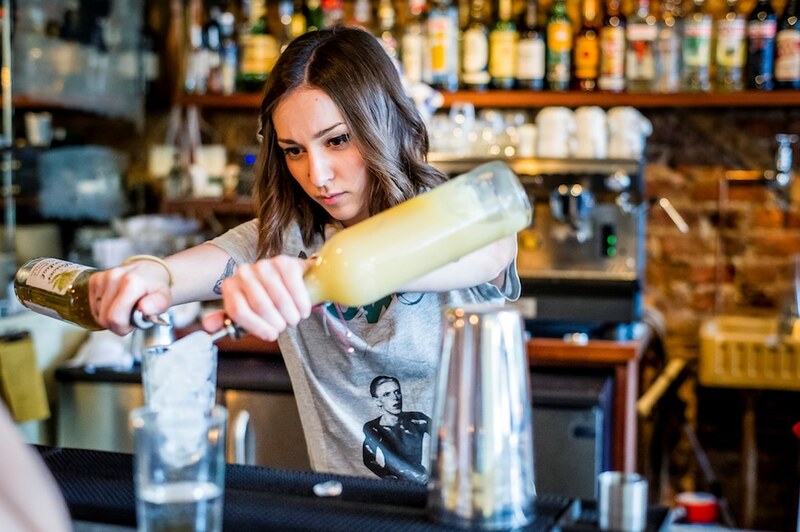 When Maud cleared our plates, she not only offered us coffees but dessert cocktails too – a Rye and Amaretto Old Fashioned, or Polpo’s twist on an Espresso Martini. 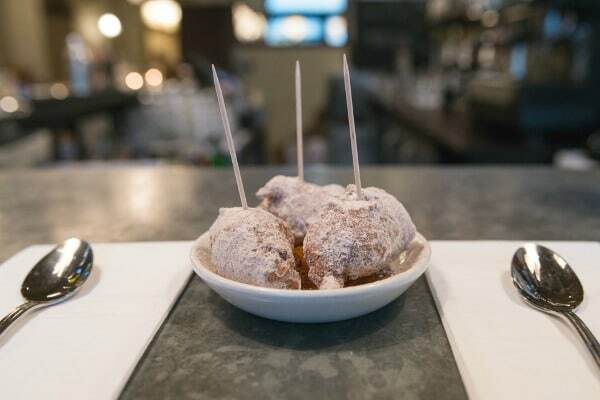 Sadly, we’d already reached our indulgence limit for the evening but, with so many drinks and dishes still to try on the menu, we’ll definitely be coming back. 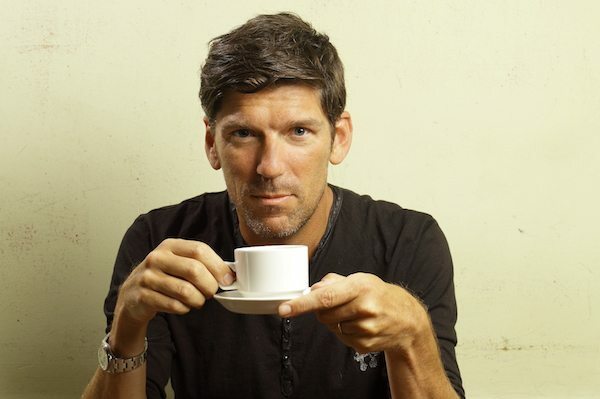 If I ever visit Italy, I hope that all the bàcaros are as good as this.